This year I started working in a group home for people who have multiple disabilities. Working with this new population who are more physically handicapped has forced me to adapt my usual activities and lessons. I want to share some of these fun ideas! These activities have been successful for my groups because I can adapt them depending on the person’s needs. Some have more physical limitations than others so read on to see how I make the activities work for everyone. Working with this new group has made me branch out and learn how to plan lessons for people who have physical handicaps. I looked to my go-to resource, Pinterest, and found some awesome ideas!! My advice when working with a new group is to think outside the box and reimagine ideas that you see. For example, I saw a craft idea for typical kids and thought of how to make it work for my group. 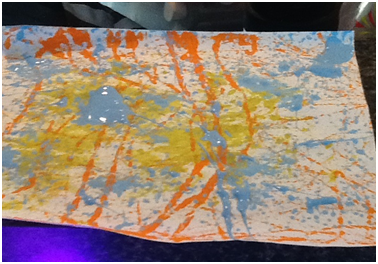 The activity is called marble painting and helps the group make their own paintings. To start, I let the members choose their colors. They all communicate in different ways- eye gaze, facial expressions, vocalizations, or AAC devices. Choice making is a way to incorporate some communication exchanges into the activity. Next, I poured some paint into the plastic cups. I swirled the marbles into the cups so they were covered in paint. To get everyone involved, I placed the large bins onto the trays of their wheelchairs. A sheet of paper goes into the bin. Think about how the students can be physically positioned to have access to the bin. If they don’t have trays, bring them up to a table. 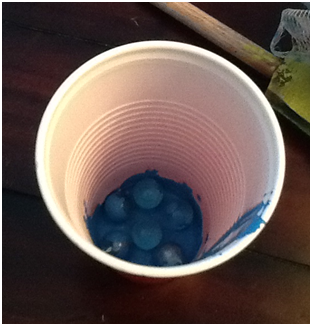 Here comes the fun part- we poured the marbles into the bin and shook them all around. This is how we paint. The marbles streak all over the paper and make awesome designs. It’s important to let the individual do as much as possible. If they can, let them hold the bins and help move the marbles around. If they need it, hold onto their hands and help them hold the bin. This would also be a fun activity for kids who have autism or developmental delays. The movement of shaking the bins could be really fun for them. 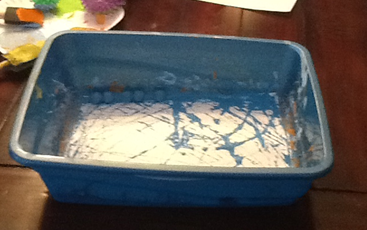 You can also use sensory toys to paint. 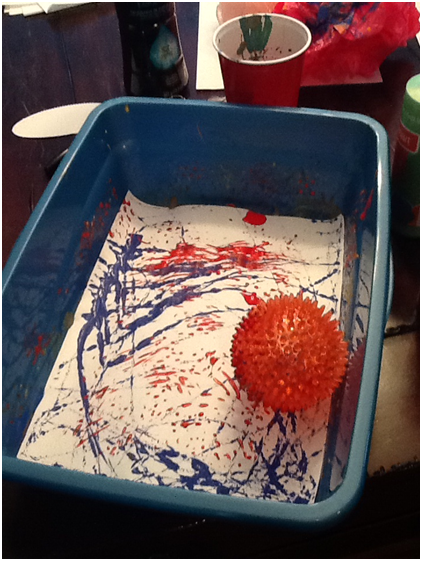 Cover a squishy rubber ball in paint and roll it over the paper. If your kids love sensory toys this can be another way to use them for fun activities. Get creative with it. You can use lots of different materials to paint. We also used tissue paper and loofas. There are tons of possibilities for this activity which makes it so accessible for different types of people! If any of you decide to marble paint please email us some pictures and we’ll include them in this blog! Talk to you soon.